The Vancouver Condo Buzz » From $229,900! PARC EAST Port Coquitlam Condos is Tri-Cities BEST Condo Value! From $229,900! PARC EAST Port Coquitlam Condos is Tri-Cities BEST Condo Value! Coming Spring 2017! Studio, one, two and two bedroom plus den homes coming to the Tri-Cities Port Coquitlam real estate district! The Parc East Tri-Cities condos will have an approximate price range between $229,900 up to $509,900. 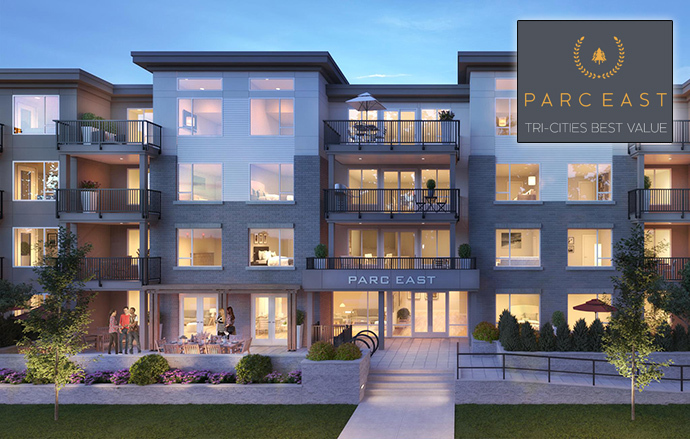 From their online marketing: Nestled near the Eastern edge of the Tri-Cities comes Parc East Condos, a refined and elevated collection of studio, one, two and three bedroom homes at a price point that you can afford. Surrounded by parks, trails, shops and amenities, this unique and thriving community is minutes away from Coquitlam Centre and the new Evergreen SkyTrain. Each of the Parc East Tri-Cities condos, home buyers will find designer features and meticulous attention to detail. Some of the interior highlights include quartz stone counters, stainless steel appliances and large kitchen islands in most floor plans. In addition, the presale Tri-Cities Parc East PoCo condos will feature beautiful laminate floors throughout the main living areas. Some of the homes will also feature cathedral height 12 foot ceilings! The spacious and functional open layouts are bright and airy with large windows and tonnes of closet/storage space. There will also be a couple of colour schemes for presales home buyers to choose from. The Parc East floor plans will also have outdoor living space for you to enjoy year round. The outdoor balconies and patios range in size between 150 square feet to 480 square feet (remember that typical downtown Vancouver balconies are between 25 to 100 square feet, so these ones are huge!) The expected layout sizes will range between 446 square feet to 1077 square feet. As mentioned above, the PoCo Parc East Tri-Cities condo pricing is anticipated to range between the low $200’s to just over $500k, making them the most affordable new Tri-Cities condo presale development this year. If you are looking for an affordable, high-end and centrally located home, then the Parc East Tri-Cities condos present the best value! For more details, please visit their marketing web site located at www.parceast.ca. Or you if would like more information as they become available, including PoCo Parc East floor plans, availability and price points, please fill out the online form at the top of this page and we will have a professional agent contact you. The project is brought to the TriCities real estate market by Atlas Global Developments, a trusted and established builder in the local area. In addition, Trillium Projects, an award winning construction management firm is part of the project team. The interior design is by another award winning firm, Cristina Oberti Interior Design Group. In both size and quality, no other development compares with the TriCities Parc East project, so don’t miss this incredible opportunity! There are only 57 condominiums for sale at Parc East TriCities. There will be several building amenities exclusive to residents at the Parc East Port Coquitlam condo building. Firstly, there’s a fully furnished amenity lounge space with a kitchenette. Secondly, there’s an outdoor entertainment space that is perfect for family and friends gatherings. In addition, the building is ideally situated in the heart of the Tri-Cities area, and also along the edge of beautiful wilderness and trails. It’s central to all three cities in the area, including Coquitlam Centre with all of its shopping, restaurants, entertainment and amenities to Port Coquitlam which has a fun and eclectic vibe to PoCo, which is just a stunning seaside community that is great for families and couples. Enjoy urban city living at suburban prices, and there are no bridges to cross! For those who want to be along a rapid transit route, look no further than the Evergreen SkyTrain Line. The closet SkyTrain station to the Parc East Port Coquitlam condos will be at Pine Tree by Coquitlam Centre. It’s about a 10-20 minute walk from your home, but it’s along the beautiful and highly rated Traboulay Trail. You can access it through Gates Park, then follow it to Lougheed and then west towards Coquitlam Centre on Lougheed. And the Evergreen SkyTrain Line will connect you to downtown Vancouver, Burnaby, Vancouver and Richmond/YVR or even out to the valley. Residents will also be within walking distance to Shaughnessy Village. The Parc East Tri Cities condos will be affordably priced from $229,900 and the layouts range from studios to 2 bedroom plus den floorplans.